One must be careful about evocations, for the markers of old graves are not always accurate. It’s October time again so my choice in fiction is already turning towards the dark, haunted and peculiar. What better place to start than H.P. Lovecraft? I’ve always found Lovecraft’s work terrifying because it is so convincing. Even though the stories are usually fantastic, there is so much attention to detail and specifics that he draws you much further into the macabre than any less precise writer would do. He also has the tremendous power of suggest and, like M.R. James, offers many a warning to the curious. As our opening quote hints, necromancy is a dangerous and never exact science. 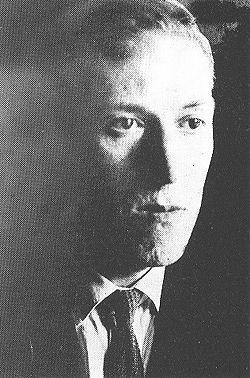 The Case of Charles Dexter Ward is an excellent example of Lovecraft’s art. In this short novel, a young man slips further into apparent madness and perversity after learning that one of his ancestors dabbled rather too successfully in the occult. Even though the tale is effectively chilling, Lovecraft shows the reader very little. The evil and unwholesome deeds usually take place behind closed and locked doors, and the reader only gets glimpses of the true horror from the reactions of innocent bystanders. We rely on half heard disturbing cries and howls and unpleasant and overwhelming odours, always a favourite of Lovecraft. The descent into the depths of Ward is also well marked by his observers, his strange nocturnal habits, brief sightings and the muffled voices and secrecy. Slowly, as befitted one of his years, he descended the ladder and reached the slimy steps below. This was ancient masonry, his torch told him; and upon the dripping walls he saw the unwholesome moss of centuries. I really didn’t think this a sensible outing, and found his later discoveries even more unpleasant, but like poor Dr Willett, I feel like I’m slowly descending into a slimy and dark pit when I read Lovecraft, and sometimes the text is so layered and dense I find myself putting the book aside before realising I have only read a small number of pages. He had not left the manuscript all night, but sat at his table under the electric light turning page after page with shaking hands as fast as he could decipher the cryptic text …. Toward the middle of the next night he drowsed off in his chair, but soon woke out of a tangle of nightmares almost as hideous as the truth and menaces to man’s existence that he had uncovered. Here’s a helping of the gothic, the fantastic and the downright scary. At the Mountains of Madness by H.P. Lovecraft is the story of a particularly disastrous expedition to Antarctica. One group of explorers meet a very gruesome end, whilst a second make some very disturbing discoveries. In the whole spectacle there was a persistent, pervasive hint of stupendous secrecy and potential revelation. It was as if these stark, nightmare spires marked the pylons of a frightful gateway into forbidden spheres of dream, and complex gulfs of remote time, space and ultradimensionality. I could not help feeling that there were evil things – mountains of madness whose farther slopes looked out over some accurse ultimate abyss. At the Mountains of Madness was rejected by the magazine Weird Tales when it was written in 1931. It’s difficult to see why, as weird it certainly is. But conventional, at least for the time, it isn’t. Whilst the opening chapters sit comfortably in the horror/science fiction genre, the later ones veer off into gothic territory when a second group of explorers unwisely decide to look further. 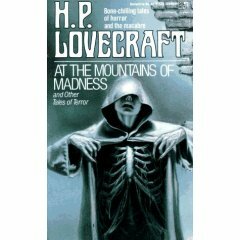 Lovecraft paints a very detailed picture of a vast, ancient and seemingly abandoned city; his description is so vivid that I felt I was walking through its claustrophobic caverns. Creepy and disturbing, but not quick-fix horror. If you haven’t been scared off by the cover art above, it’s from a 1991 edition of the book – described by Amazon as a mass market paperback. 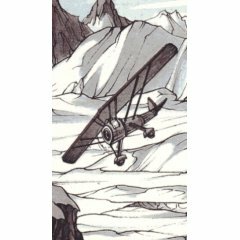 You couldn’t find more of a contrast with the cover of a different edition, below, which has more of a connection with the story, showing the foolish explorers travelling into Antarctica by air. The first cover suggests the quick-fix horror, the second more a Boy’s Own adventure about to go wrong, or a 1930s update of an H. Rider Haggard adventure. A sort of King Solomon’s Mines where no one gets out alive – or sane.